Two ‘‘No Rogue Trader Zones’ have been established in Coleshill in North Warwickshire under a scheme operated by Warwickshire County Council’s Trading Standards Service and supported by Warwickshire Police. The new ‘No Rogue Trader Zones’, one in the north and one in the south, have been launched as part of national ‘Scams Awareness Month 2016’. 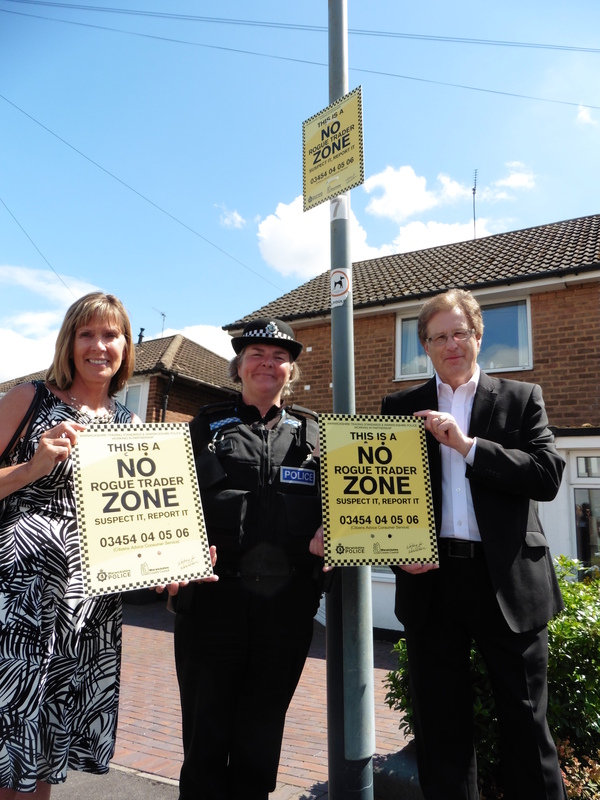 685 properties located in 17 roads in ‘hot spot’ areas across the town form the new ‘No Rogue Trader Zones’. Each property in the new ‘No Rogue Trader Zones’ will be issued with a ‘No Rogue Trader’ door/window sticker and information booklet following the theme of staying safe from cowboy traders. Street signage will reinforce the ‘No Rogue Trader’ message and act as a warning to rogue traders that they will be reported if they attempt to trade in the area. Residents are encouraged to report any suspicious activity to Warwickshire Trading Standards Rapid Response Team via the Citizens Advice consumer helpline on 03454 04 05 06. Trading Standards Officers will reply either in person or by phone to a report of a suspicious caller in the area. (Left to right) Janet Faulkner Head of Warwickshire Trading Standards, Warwickshire Police Officer Ellen Beaty, Warwickshire County Councillor Peter Fowler, elected member for Coleshill.